Expensive and laborious to produce, a single woodcut could be recycled to illustrate scores of different ballads, each new home imbuing the same image with often wildly diverse meanings. Katie Sisneros explores this interplay of repetition, context, and meaning, and how in it can be seen a parallel to meme culture of today. 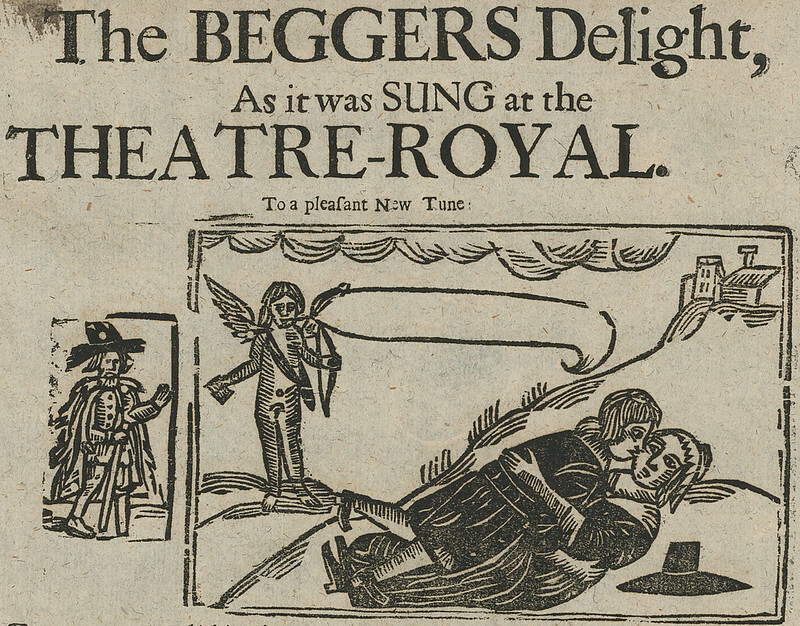 Detail from The BEGGARS Delight, EBBA 34937. As explored later in the essay, this woodcut would be reused in many different contexts, the speech bubble variously filled accordingly — Source. 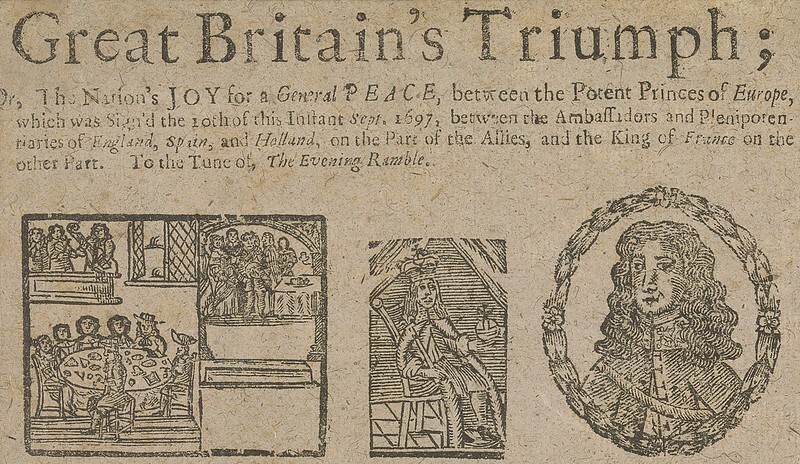 Featured prominently on the title page of the pamphlet is that very scene: an English ship nose-to-nose with a Turkish ship (evidenced by the crescent moon flags and turban-wearing men) and two unfortunate human figures hanging gruesomely by their necks from the mast of the ship. The image perfectly encapsulates the harrowing moment. 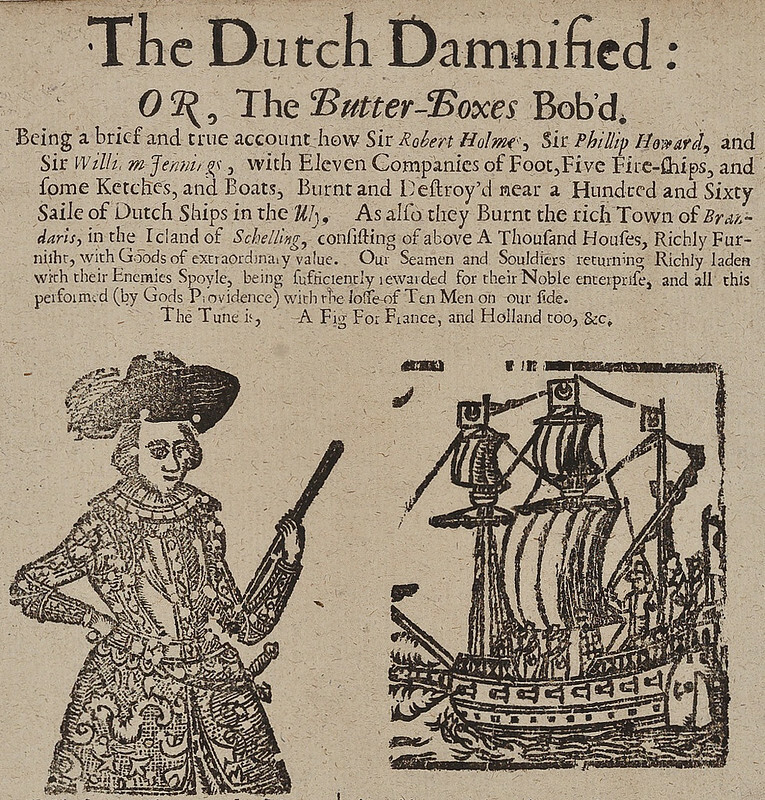 Image from the title page of Ward and Danseker, Two notorious Pyrates Ward an Englishman, and Danseker a Dutchman, a duplicate print of Newes from Sea with a slightly altered title — Source. In all likelihood, the woodblock that produced the imprint featured on the pamphlet was created specifically for that text. But it was far from a one time use illustration. Between 1609 and 1617 the woodblock either changed hands or was lent, from Edward Allde to George Eld, who employed it in 1617 in another news pamphlet that told a similarly harrowing tale of English merchants battling bravely against a horde of Turkish pirate ships. Although A fight at sea, famously fought by the Dolphin of London against fiue of the Turkes men of warre, and a satty the 12. Of Ianuary last 1616 does not mention a grisly double hanging in its text, the reuse of the woodcut was perfectly logical and thematically appropriate. As the century drew on, however, this woodblock would go through some dramatic changes. Its representational function would morph over time as it changed owners and began to be used primarily to illustrate broadside ballads. These two ships would reemerge time and time again on printed ballads, each time in a different context and performing a different representational function. If there was indeed method and meaning to what might appear to a modern-day viewer to be the almost random assignment of images to only vaguely related text, how did it manifest? 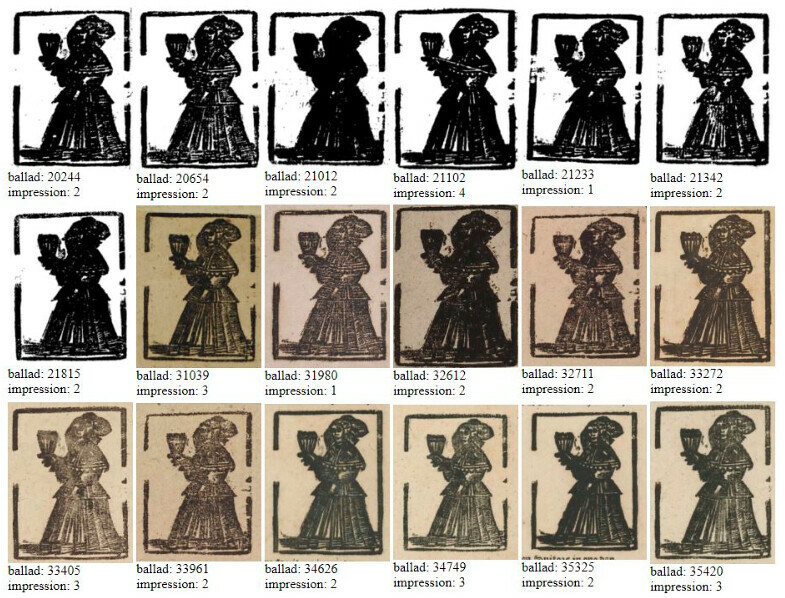 In what ways were woodcuts reappropriated for different representational needs, and how were consumers of these texts processing the images that were recurring consistently in their everyday lives? By exploring a few examples (and revisiting our pirate ships later in their publishing life) we can start to understand how contemporary audiences engaged with individual texts as well as with the pantheon of popular literatures that influenced their lives. We can also see how this practice of reuse parallels aspects of our own modern culture, in particular the phenomenon of the internet meme. The re-used woodcut can be seen to function as a sort of proto-meme, the meanings of an image multiplying through continued reuse in varying contexts. This reuse was pervasive across all manner of popular print genres, from news pamphlets to political propaganda. 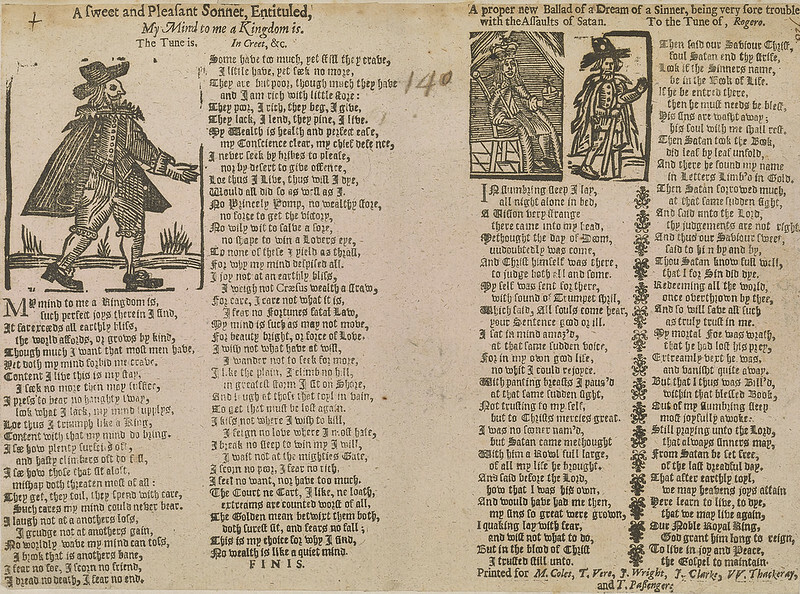 Among these, the broadside ballad distinguishes itself: eminently cheap and printed in mass quantities, the genre was consumed by a broad swath of English subjects – an ideal case study. 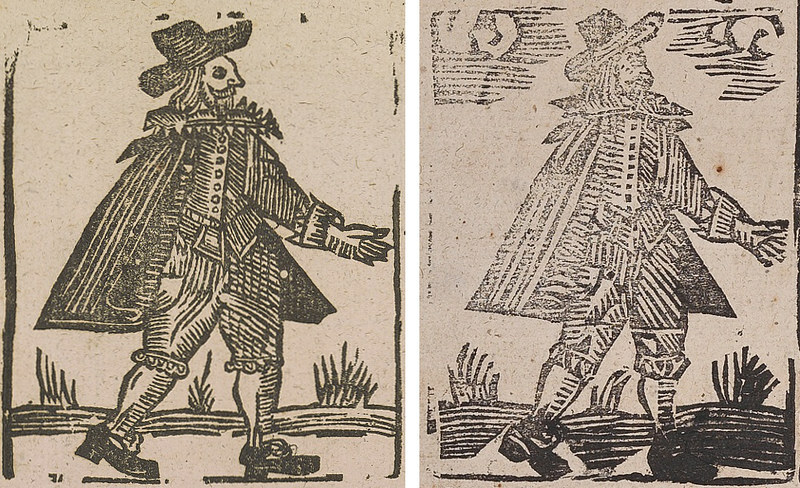 The reuse of woodcuts was pervasive across all manner of popular print genres, from news pamphlets to political propaganda. 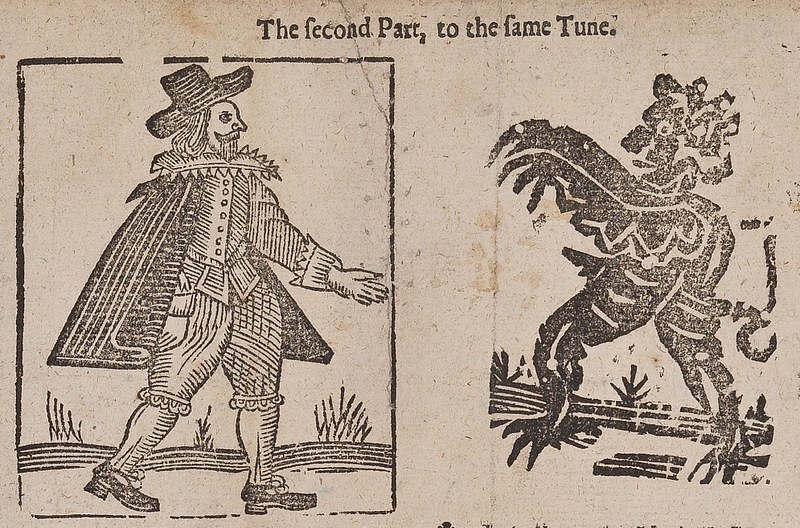 Among these, the broadside ballad distinguishes itself: eminently cheap and printed in mass quantities, the genre was consumed by a broad swath of English subjects – an ideal case study. A Sweet and Pleasant Sonnet, Entituled, My Mind to me a Kingdom is and A proper new Ballad of a Dream of a Sinner, being very sore troubled with the Assaults of Satan, EBBA 21665 — Source. Left: detail from A Sweet and Pleasant Sonnet, EBBA 21665 — Source. Right: detail from Truth’s Integrity, OR, a Curious Ditty Called, Love will find out the Way, EBBA 32055 — Source. The how-de-do man facing his true love in a detail from Truth’s Integrity, EBBA 32055 — Source.. This singular image brought with it a lifetime of meaning, and images played as much a role in creating cross-references between ballads as words did (and, of course, the melodies associated with the ballads as well). How you engaged with a viewing of the how-de-do man depended on your previous experiences with him in other ballads, and printers could draw on that experience by using familiar images in unfamiliar constructions to create new meaning. In Strange News from WESTMORELAND, the how-de-do man’s recognizable visage, heavily associated with the idea of a doting lover, has been reassigned to a new, darker role. The ballad tells the story of a cruel husband who drunkenly strikes his wife and kills her, after which Satan himself punishes the man with death. Rather than approaching his lover for an impending embrace, therefore, the female figure is turned away from the man, who is himself approaching the devil. Detail from Strange News from WESTMORELAND, EBBA 32030 — Source. This is not to say that E. Andrews, who published Strange News from WESTMORELAND in the 1660s, was unaware of the how-de-do man’s prior usages in ballads, and thus presented to a viewing audience a version of him that would have been seen as unrecognizable, confusing, or incorrect. Rather, those old associations are precisely what makes his dramatic redirection in Strange News from WESTMORELAND all the more poignant: an old protagonist, an everyman hero with whom readers could so easily identify, has turned heel. Our prior encounters with a picture help define future encounters with it, and that very familiarity could sometimes be deftly turned against us. What better way for a cautionary tale about uncivilized behavior to truly drive home its point than by turning the common man into the villain? The sovereign, the next image over on the broadsheet at the center of our web, illustrates the ways in which a single woodcut could expand or contract in meaning depending on its use. Depicted as a header image for the ballad A Dream of a Sinner, the sovereign might represent King Charles II, invoked in the final lines of the ballad: “Our Noble Royal King, / God grant him long to reign, / To live in joy and Peace, the Gospel to maintain.” Alternatively, he might represent one of the main characters of the tale: Christ, who visits a wayward sinner in his sleep. In 1685’s David and Bersheba, the sovereign is the biblical King David. The image clearly makes no advances toward accurately depicting the King of Jerusalem, but there is little question as to his identity given the context of the ballad. It is clear that the female image next to him, in this case standing in as Bathsheba, was produced by a woodcut with an already long history: much of her detail is lost here, but viewers might’ve remembered seeing her pleated dress and face on ballads from the decades prior. 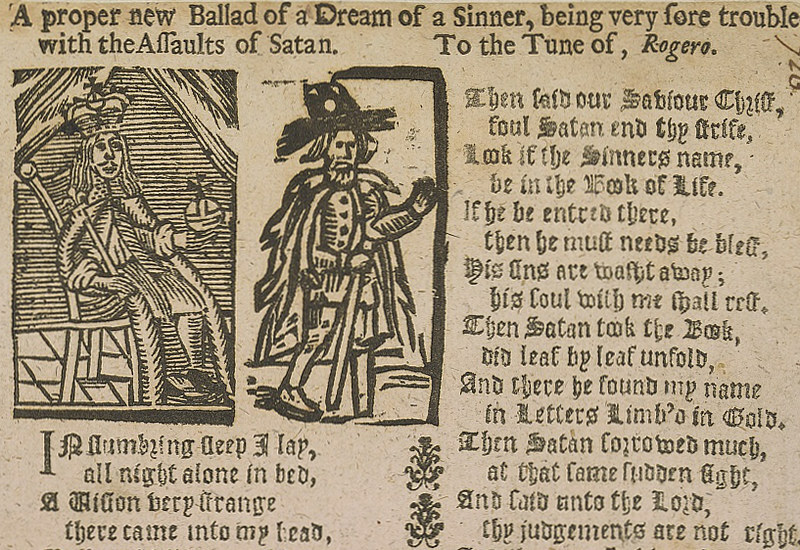 Left: detail from A proper new Ballad of a Dream of a Sinner, being very fore troubled with the Assaults of Satan, EBBA 21665 — Source. Right: detail from David and Bersheba, EBBA 20654 — Source. EBBA woodcut cluster Id: 147, showing variations in the female figure woodcuts. Jump ahead just a few years to 1697’s Great Britain’s Triumph; Or, The Nation’s JOY for a General PEACE, between the Potent Princes of Europe, and the sovereign might represent any one of the nations concerned in the September 20, 1697, signing of the Treaty of Ryswick, about which the ballad was printed. The treaty ended the Nine Years War between France and the Grand Alliance between England, Spain, the Holy Roman Empire, and the United Provinces. The seated ruler’s crown and orb don’t suggest any nation in particular: he might be the image of King William of England or Louis XIV of France, both of whom are mentioned in the ballad, or he might simply be the embodiment of sovereignty itself. Detail from Great Britain’s Triumph, EBBA 20995 — Source. All of these varieties might seem strange to a modern audience. How could a single image on a single ballad possibly represent more than one thing or person at the same time? According to Marsh, these minor discrepancies in detail, slippages in textual versus image representation, could have been easily filtered out by viewers who were accustomed to finding meanings with which we in the present day struggle. Returning a final time to our example broadsheet, we are left with the walking stick man. He too crosses over a number of other ballads and wears a variety of hats, as it were, in each of them. In the ballad A Dream of a Sinner walking stick man is the very sinner about which the title speaks, who is visited by Jesus Christ and Satan one night while in a deep sleep, and who awoke joyfully to the realization that he was saved from Satan by Christ’s sacrifice. It’s an uplifting moral tale meant to speak to all good Christians, who are in turn also all sinners. If walking stick man, with this tattered robes, hat, and staff can represent the journey from sin to salvation, or the trials of our conscience, he can also represent one of life’s other great odysseys: love. In The BEGGARS Delight, walking stick man plays a poor beggar who is just as capable of loving his lass “as he that has thousands, thousands, thousands, / He that has thousand pounds a year.” Walking stick man’s appearances in broadside ballads seem to have a common thread: his everyman representation is meant as a salve, a comfort to those whose lot in life disadvantages them here on earth. When a viewer sees walking stick man on a broadsheet, he or she might already be able to ascertain the moral of the ballad: you may be poor, but all men are sinners and none are immune to the consequences of death. 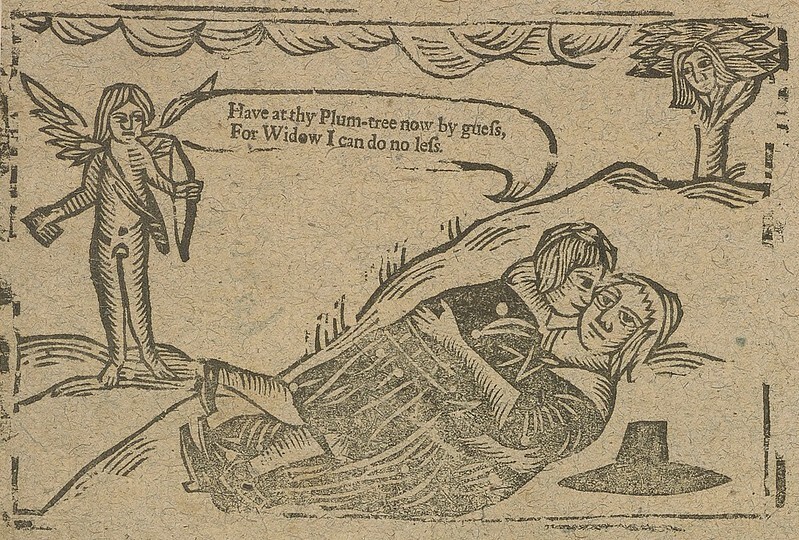 I want to divert one last time, following a new trail, this time from The BEGGARS Delight to briefly track the other image on that broadsheet, one that illustrates another common way in which woodcut images were intended for reuse: the two lovers tenderly embracing, empty speech bubble above their heads. Detail from The BEGGARS Delight, EBBA 34937 — Source. Detail from The Hampshire Miller, short and thick, EBBA 21006 — Source. The particulars are somewhat incorrect: in the image, the couple is lying outside, not inside a house. But broadside ballad printing was primarily a commercial pursuit, and printers would have profited greatly off of reusing a thematically related woodcut rather than concerning themselves with the accuracy of details. Two lovers might as easily be embracing on the ground because one has fallen ill: one image with various possible meanings. 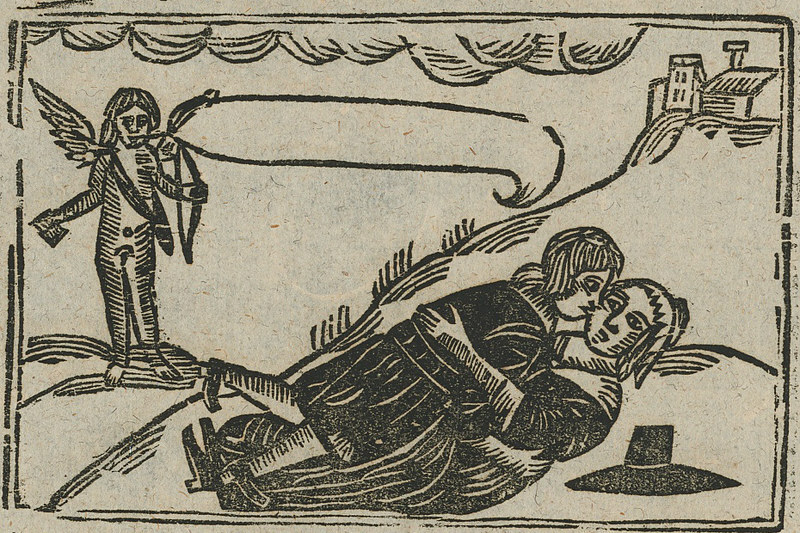 In this way, viewers were “reading” woodcut images not just as metaphorical representations specific to the ballad, but as a point of reference that calls upon a lifetime of experience consuming printed texts: a broadside ballad was simultaneously an individual text and part of a compendium, an anthology of cultural knowledge that had its parts drawing upon and from within each other to create meaning. Detail from The ranting Whores resolution; Wherein you find that her only Treasure / Consisteth in being a Lady of Pleasure, EBBA 21149 — Source. Detail from The Mourning Conquest. Or, The Womans sad Complaint, and doleful Cry, TO see her Love in Fainting fits to lye, EBBA 21151 — Source. What, then, of our warring ships? How was the woodcut of the English and Turkish ships with the grisly hanging scene reappropriated as the seventeenth century drew on? 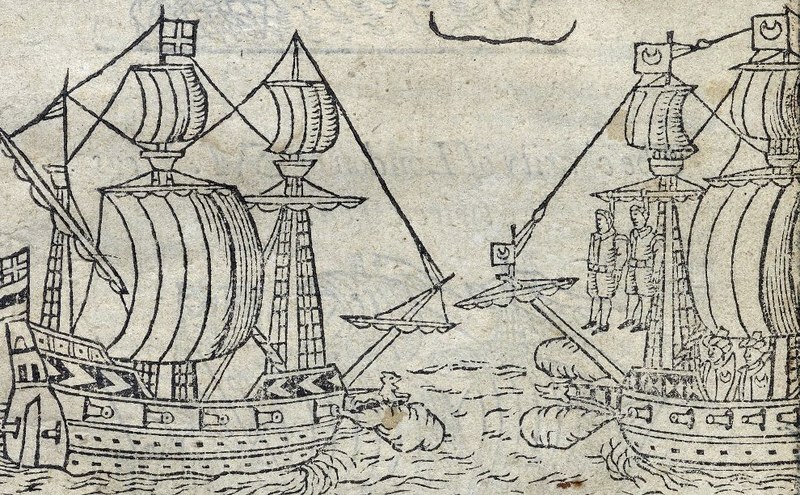 Scouring the available literature, this author could find only one other appearance of the two ships together, in 1621. Sometime before then, the woodblock itself had gone through a subtle but substantial change. Newes from Argeir tells the harrowing story of an English mission to Algiers that had been sent to free captive slaves but were intercepted by a fleet of Turkish ships prepared for a fight. The English won the day, frightening away the Turks and “left unto our Englishmen / The golden prize of honour then, / which was the worthy conquest of the day.” Of course, the narrative of a resounding English victory against an enemy fleet wouldn’t have been particularly well served by a woodcut that showed two men being executed from the mast of a Turkish ship. And so, at some point between 1617 and 1621, after the woodblock changed hands from George Eld to George Purslowe, who printed Newes from Argeir, the unfortunate men were unceremoniously etched out of the block. The only evidence that they had once been the dramatic centerpiece of the image is a single arm, still visible over a portion of the ship. 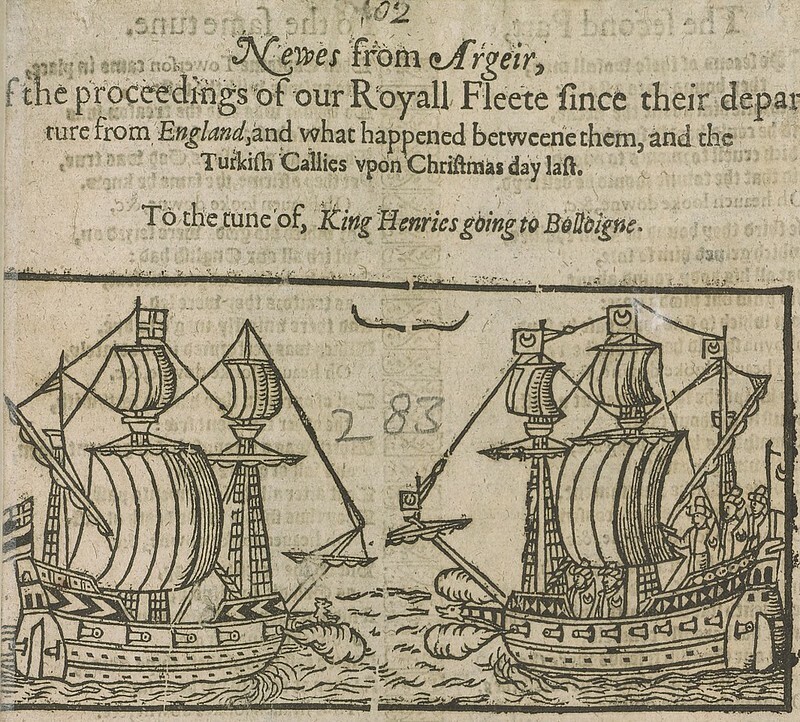 Detail from a facsimile of Newes from Argeir, of the proceedings of our Royall Fleete since their departure from England, and what happened betweene them, and the Turkish Callies upon Christmas day last, EBBA 20281 — Source. Details from a facsimile of Newes from Argeir, of the proceedings of our Royall Fleete since their departure from England, and what happened betweene them, and the Turkish Callies upon Christmas day last, EBBA 20281. Shortly after, it seems the ships were broken apart entirely, and the Turkish ship sans hanging men would make frequent appearances in naval ballads from the 1650s through the rest of the seventeenth and eighteenth centuries. 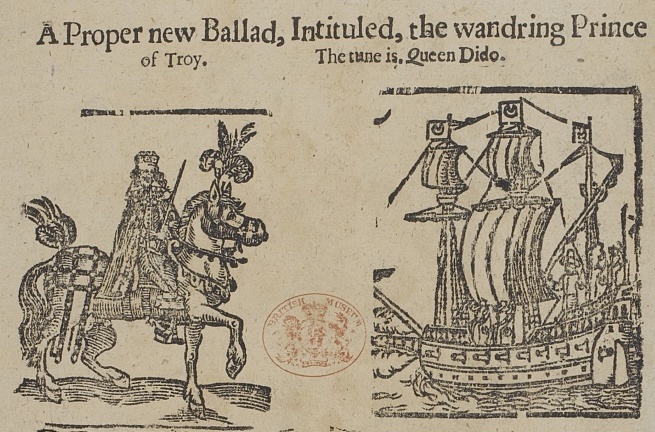 At times, the ship illustrates the tragic tale of Aeneas and Queen Dido, as in A Proper new Ballad, Intituled, the wandring Prince of Troy (1658–64, EBBA 30394). Or perhaps one of a number of enemy Dutch ships that an English fleet sacked and destroyed, as in The Dutch Damnified (1663–74, EBBA 31734). It might even depict a ship that brought with it a nefarious man who successfully wooed a married woman in a ballad meant to warn housewives against cuckoldry, as in A warning for married Women (1658–64, EBBA 31991). Detail from A Proper new Ballad, Intituled, the wandring Prince of Troy, EBBA 30394 — Source. Detail from The Dutch Damnified, EBBA 31734 — Source. Detail from A warning for married Women, EBBA 31991 – Source. 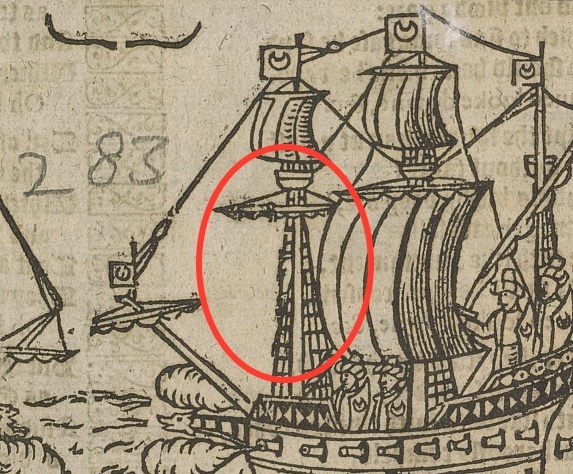 You didn’t have to be a dedicated collector of broadside ballads like Samuel Pepys to notice recurring images in broadside ballad literature, and it is possible a casual reader might have remembered seeing this Turkish ship a few decades prior in a completely different context. 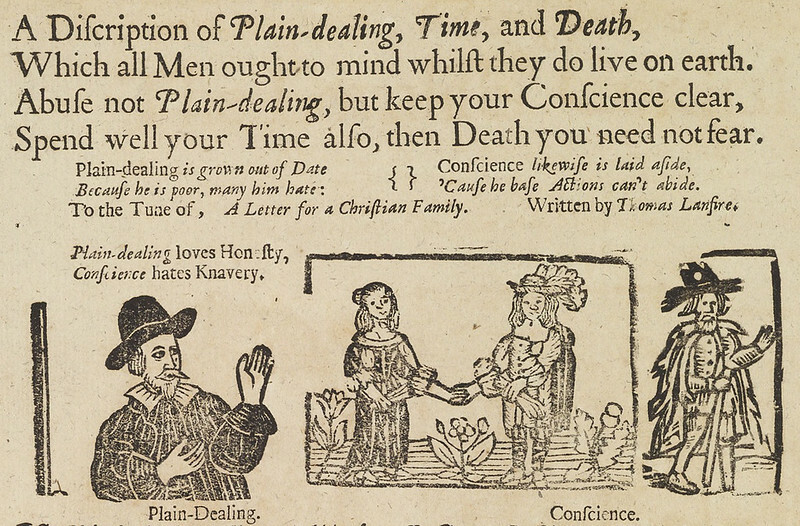 Early modern English viewers were accustomed to reorienting or expanding the catalogue of meanings connected to a woodcut image, drawing them into an even deeper engagement with the text at hand, one that recalls a pantheon of previous texts. It is a collective cultural phenomenon that is not unique to the early modern period, nor did it die out after the ubiquitousness of woodcut impressions in popular print waned. The business of stock photography has trained the modern consumer to simultaneously accept the presence of an image that they’ve likely seen before in a completely different context, while at the same time “reading” the image as something fresh and specific. Just as a seventeenth-century printer might dig laboriously through his woodcut collection to find the perfect (or as close to perfect as his collection allows) woodblock, so too might a modern-day author or digital publisher have to choose the right search terms on a stock photo website to convey, with precision, “sad woman eating salad” or “small dog in a tophat”. In recent years meme culture has exploded the potential of stock imagery. The repetition and reuse of images in internet memes, particularly those that deliberately exploit stock photos that are somehow both generic and oddly specific, has striking parallels to woodcut culture in seventeenth-century England. Just ask “distracted boyfriend”, lustfully ogling a passing woman while his indignant girlfriend looks on in disgust. Originally uploaded to the stock photo database iStock under the description “Disloyal man with his girlfriend looking at another girl”, this twenty-first-century “how-de-do man” has become common fodder for internet culture. “Disloyal man with his girlfriend looking at another girl” Credit: Antonio Guillem, iStock. He reappears again and again, each of the characters in the image relabeled to create a new nexus of interpretation. But this time, printers and booksellers are not the gatekeepers of meaning. Anyone can download the image, add their own text, and share their meme with an audience online. Whereas woodcuts could be shared unencumbered by copyright laws that wouldn’t start appearing until the eighteenth century, stock photo imagery and the memes that use them seem to replicate despite their legal ownership. Although stock photos like the disloyal man’s are not intended to be used for free, the internet has made paywalls easily scalable. Once the image sharing and content aggregating websites get ahold of them, there’s no stopping their potential spread. A quicker, easier, and more anonymous process than a woodcut changing hands from one printer to another, but a not dissimilar one. 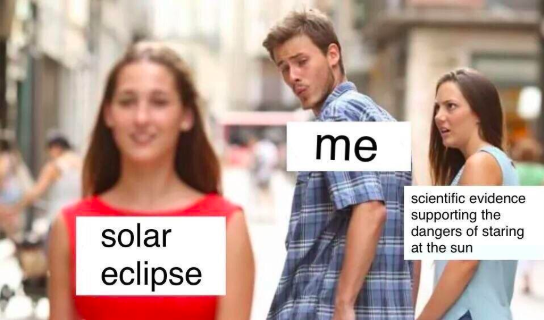 Just like early modern woodcut images, distracted boyfriend and countless other stock photo meme characters have created an anthology of cultural knowledge. Their cultural currency feeds an expanding and self-replicating web of meaning. 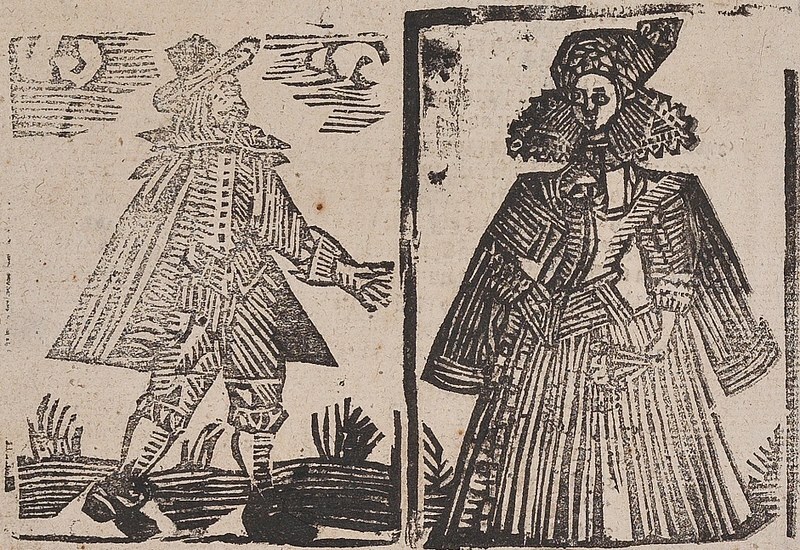 The rich early modern woodcut images thankfully still left to posterity offer numerous threads to follow, webs to weave, and connections to draw. In doing so, we can begin to understand early modern consumption of popular literature and recognize the ways in which we reflect some of the very same habits today. Katie Sisneros is a Mellon/ACLS Public Fellow working as Content Analyst at the Minneapolis Institute of Art. She earned her PhD in English Literature from the University of Minnesota Twin Cities, where she studied representations of Muslims in seventeenth century English broadside ballads and other popular literature. See her on Twitter here. Bringing together diverse scholars to represent the full historical breadth of the early modern period, and a wide range of disciplines (literature, women’s studies, folklore, ethnomusicology, art history, media studies, the history of science, and history), Ballads and Broadsides in Britain, 1500-1800 offers an unprecedented perspective on the development and cultural practice of popular print in early modern Britain. Dr Spufford’s book examines the profits made by early English publishers, the scale of their operations, and the way the ‘small books’ were distributed throughout the country.